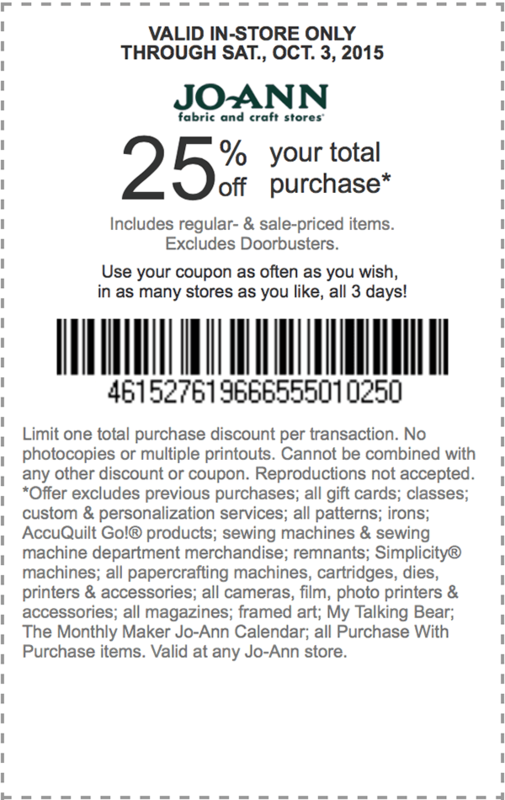 Savvy Spending: JoAnn Fabrics: 25% off total purchase coupon through 10/3 (valid on sale items too)! 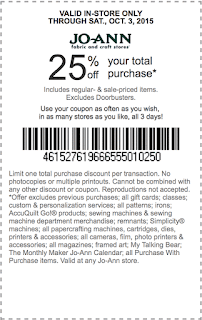 JoAnn Fabrics: 25% off total purchase coupon through 10/3 (valid on sale items too)! JoAnn's has a new in-store coupon valid for 25% off your Total Purchase of both regular AND sale-priced items valid through 10/3! You can also print a 40% off any regular priced item coupon! You can print or show the coupon on your phone (just go here and click the purple “Take it With You” link to have it sent to your cell).